Habit: Perennial herb, shrub-like, finely strigose. Stem: ascending, clustered, branched, (2)5--15 dm. Leaf: irregularly pinnate to +- palmate, well spaced; stipules gland-like or 0; leaflets 3--5, 5--17 mm, oblanceolate to obovate, length > 3 × width; axis (including petiole) 1--8 mm, not flat. Inflorescence: 1--3-flowered, peduncle 20--60(130) mm, bract near top, small or 0. 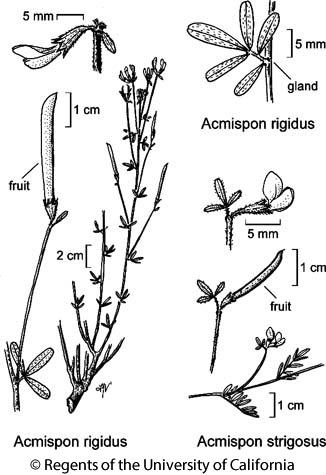 Flower: calyx 5.5--10 mm, lobes < tube, finely strigose; corolla 12--24 mm, yellow to cream, wings > keel; stigma +- glabrous. Fruit: slowly dehiscent, spreading or erect, much exserted, 2--4 cm, linear, +- straight, generally flat, generally glabrous; beak curved, 0.5--1.5 mm. Seed: 18--30. Chromosomes: 2n=14. Citation for this treatment: Luc Brouillet 2012, Acmispon rigidus, in Jepson Flora Project (eds.) Jepson eFlora, http://ucjeps.berkeley.edu/eflora/eflora_display.php?tid=91720, accessed on April 23, 2019.